Chris Rudd is a human-centered designer and community organizer with a passion for social justice. Dinner follows the public event, "Youth, Design, and Juvenile Justice Reform," at 5:00 pm in Rocky 003. 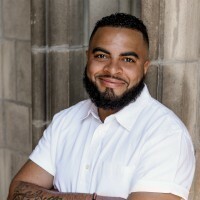 Chris Rudd has worked with youth on the South and West Sides of Chicago, challenging them to engage with their communities through activism and technology. Rudd has helped youth from Chicago to the Bay Area design eight civic apps, including Expunge.io.